Back in New York… or shall I say the freezer? I had thought that below a certain level of cold – say minus 10 – it is all the same, which is too cold. But no, no, no… there are 50 shades of cold below freezing! And the bone chilling, face freezing cold of this winter of 2015 is the worst I have ever known. One look outside, and I was ready to get back on that plane and go back for another two months! That too, after a flight of 14 hours… Yeah, exactly like Punxsutawney Phil who saw his shadow on Feb 2nd and went back into his burrow for another 6 weeks of slumber! Spent about two months in the beautiful tropics. Of all the things I managed to see and do this time around – blue oceans with sandy beaches, hikes on green mountains, visits to tea estates and factories, houseboat rides on backwaters – what has made a lasting impression on me is a street play I saw in Calicut, Kerala… yes, that sliver of a state in the south western corner of India. 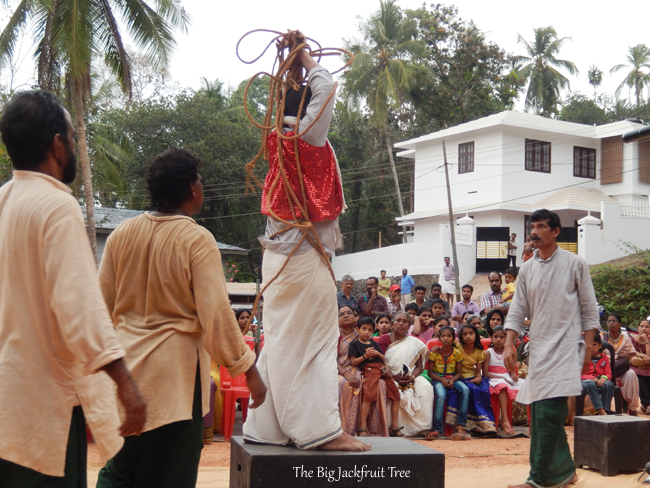 The aim of the play was to focus attention on the rise of superstitions and their exploitative tendencies in the Kerala society. 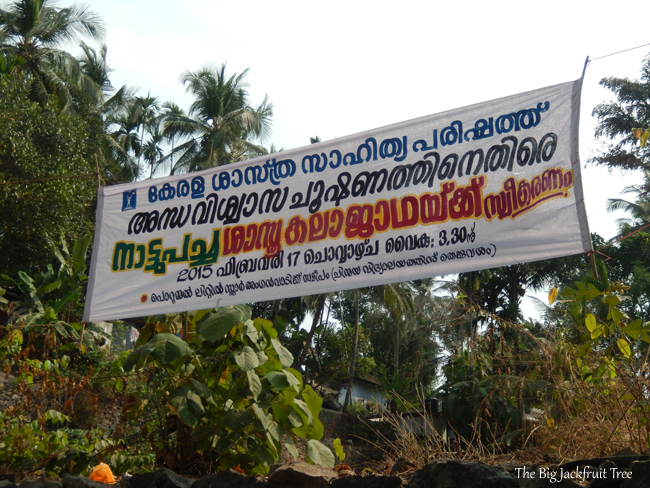 It was organized by Kerala Sasthra Sahithya Parishad (KSSP: Kerala People’s Science Movement – not a literal translation). 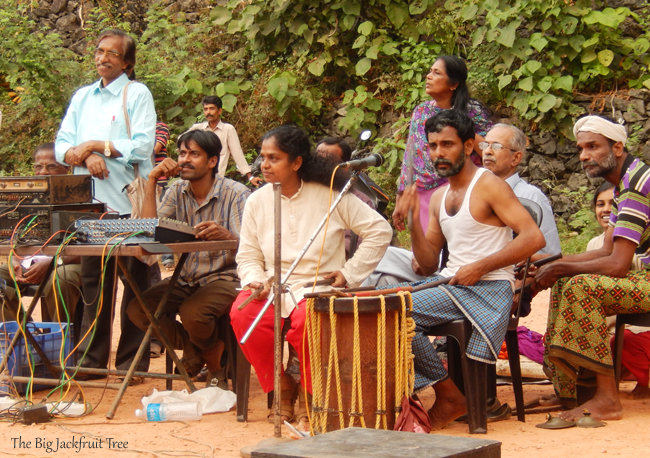 KSSP is a unique social scientific movement in Kerala that came into being with the dual aims of bringing science and scientific thinking to the common people and influencing the direction of scientific research into channels that will benefit the people. It is unique in the sense that among all the socially relevant popular movements anywhere in the world, there is no other such organisation that has an exclusive focus on science and scientific mindedness. And if Kerala has topped the United Nations Human Development Index despite its high population density and low per capita income, making it stand apart from the rest of India, KSSP and the scientific temper it has managed to popularise, have a major role in that achievement for sure. The brainchild of a group of scientists and science writers, KSSP was formally established in 1962. KSSP’s concentration on active communications and education has paid off big time, making it an integral part of the Kerala social fabric. KSSP is the largest publisher of science and technology themed books in the state of Kerala. It also publishes four periodicals, two of them meant for children. Science quizzes and talent tests are conducted at primary and secondary school levels and science clubs are organised throughout the state. KSSP has carried out successful campaigns against industrial pollution, deforestation, unwise water management policies, etc. 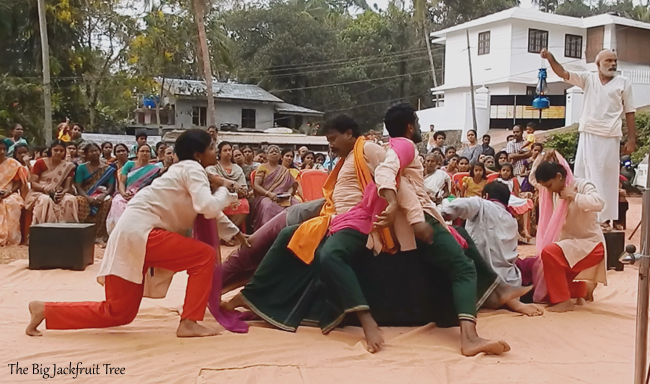 In addition to traditional outreach mechanisms like lectures and symposiums, and articles published in newspapers, KSSP uses ‘kala jatha’, an art form encompassing elements of street theater and folk story telling traditions to increase awareness and nurture a scientific outlooks among the population. 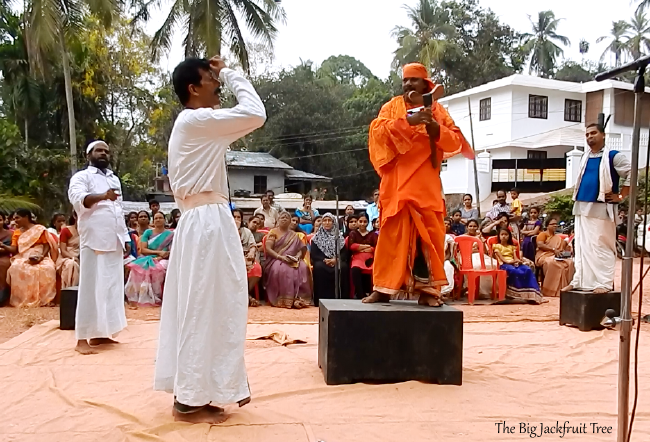 Teams travel throughout the towns and villages of the state performing in front of audiences large and small. 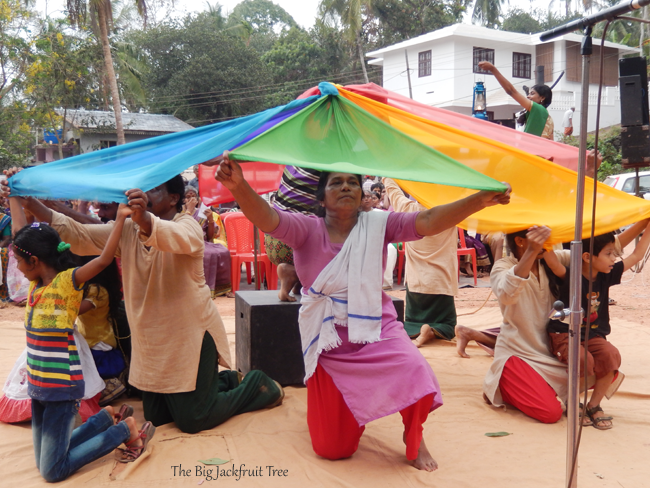 The kala jathas spread socially relevant messages based on scientific facts and generally promote scientific thinking and reasoning among the populace. 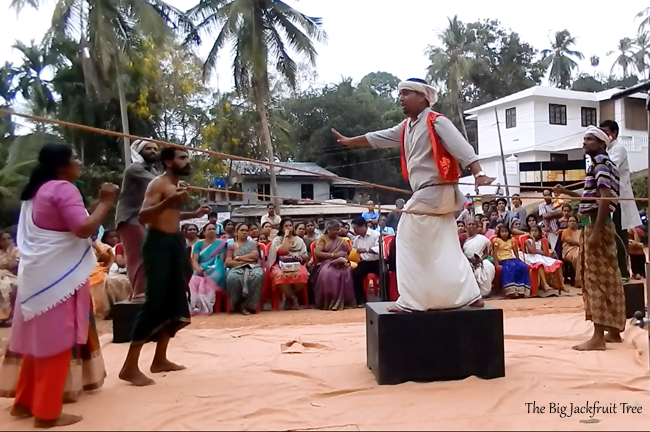 The performance that I was fortunate enough to see was part of ‘Nattu Pacha’. Google Translate gave me ‘indigenous green’ as the English synonym, which even I know is nowhere near the intended meaning… would ‘the goodness of the countryside’ work? Roughly, I would say. 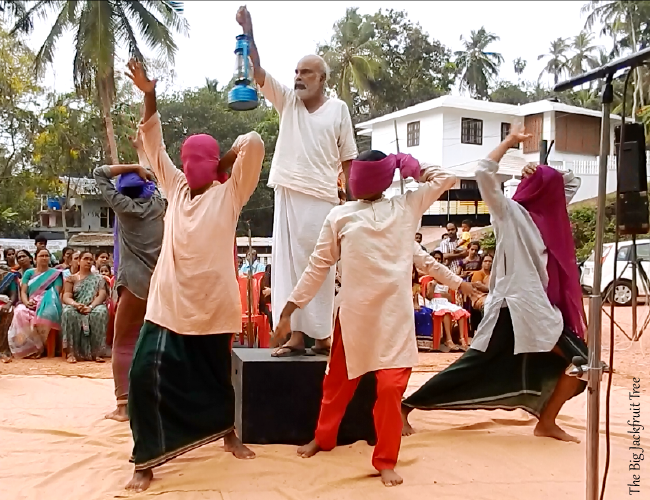 As part of Nattu Pacha kala jatha, ten groups of performers travelled throughout the state and performed the play at over 400 venues. The main factor behind the success of the effort is nothing other than the dedication of all those involved. I do not remember the names of the actors; this was not a performance that hinges around a few stars… this was a joint venture in the true sense of the word. 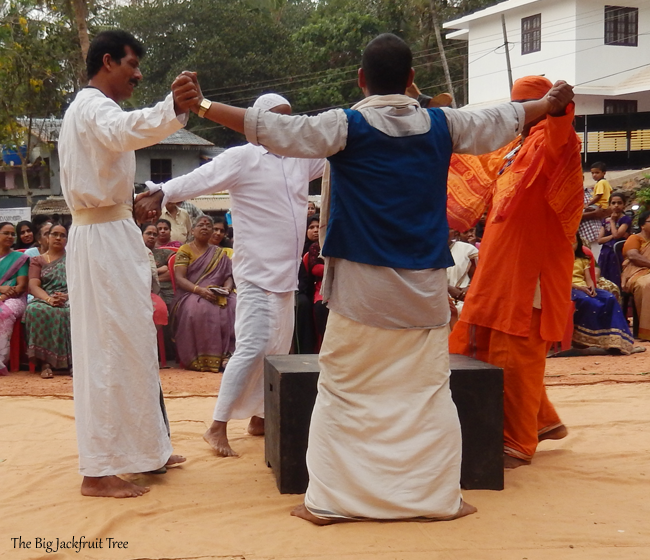 With the minimum of props and costumes, the actors brought out the story of what happens to a hitherto peaceful village when religious powers, supported by exploitative commercial interests, move in and take control of people’s minds. It was like, in a manner of minutes, a barren playground turned into an elaborate stage, riveting the audience’s attention. The ease with which the actors slipped in and out of character is amazing, especially when you consider that none of the participants are professionally trained actors. And I loved the background singers who equaled if not surpassed the actors. The next time I’m in Kerala, the first thing on my to-do list will be to check for any interesting activities organised by KSSP! P.S. I’m sorry that in a small blog post, it is not possible to even touch upon all of KSSP’s activities; so, read about it all at the KSSP’s own website. Grab samples from the work space of a unique People’s Science Movement. The theme science for social revolution is luminously obvious in the fusion of the two cultures. Great to be a small atom of the macroKSSPmolecule. 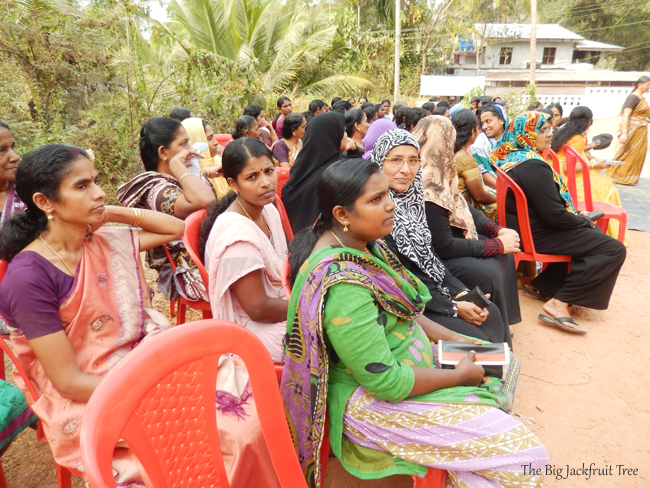 An excellent summary of activities of KSSP and on life in Kerala. Thanks. I like the theme of the street play. I love reading your posts! Welcome back!